Many men and women who have excess amounts of weight suffer from insecurities and confidence-related issues that stem from that weight. Most of these people believe that those insecurities will disappear once the weight is gone. And while this is true for many individuals, this is not a guarantee for everyone. Significant weight loss often leaves behind a considerable amount of excess, sagging skin because the skin stretches as weight accumulates. Unfortunately, while you can alter the amount of fat in your body, you cannot restore skin elasticity, especially as you age; this means that the quality of your skin will remain the same even after the weight is gone. Many weight loss patients experience dissatisfaction with this excess skin. Often, it makes them feel as though they can’t truly enjoy their weight loss because their real results are hidden beneath layers of sagging skin. This feeling of sadness is truly unfortunate because weight loss of any amount is something to be celebrated. Losing weight isn’t easy; it requires hard work, dedication, and emotional strength. Weight loss is something to be proud of, and the remaining skin shouldn’t stand in your way of feeling this pride. 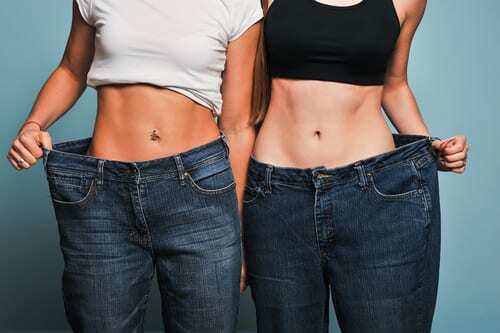 If you are experiencing emotional insecurities from excess skin after massive weight loss, then body contouring procedures can help you finalize your weight loss transformation. Excess skin is both aesthetically displeasing and physically uncomfortable. Excess skin obscures a patient’s newly slim figure, which often causes their hard work to go unnoticed. Also, excess skin leads to skin irritations such as rashes and makes exercising to maintain weight loss difficult. With cosmetic body contouring procedures, this skin can be a thing of the past. Embrace your body and let your confidence levels explode by finally showing off your transformation. A common area for excess skin after weight loss is the abdomen as this is a central area for excess fat to accumulate. Treating this excess skin is most commonly performed through a tummy tuck. Tummy tuck surgery contours your abdomen by removing excess skin, tightening the underlying muscles, and eliminating any lingering pockets of fat. This procedure allows you to attain a firm and sculpted midsection that will highlight your weight loss. While this procedure can aid nearly any level of skin laxity, it sometimes needs a little help. The incision for the tummy tuck generally runs horizontally hip to hip underneath the bikini line. During the procedure, the skin above that incision line is redraped and pulled down, and the excess skin is removed. Since this skin is stretched downward, the level of your belly button will also move down, causing it to sit in a less than desirable position. Umbilicoplasty, also known as belly button reshaping, is a standard tummy tuck combination procedure. This treatment allows for the belly button to be raised back up to an aesthetically pleasing level on the stomach. Between these two procedures, your abdominal weight loss will finally be on full display. For more information about body contouring after weight loss, contact us today by calling our office at (216) 350-3175. While removing excess skin that remains after weight loss with procedures like tummy tuck or arm lift surgery is one thing, continuing those results after your procedure is another. Surgical cosmetic procedures can get your body contours where you want them to be but maintaining those results is up to you. Fortunately, you’ve already gone through the most challenging aspects; you’ve lost the weight, undergone surgery, and dedicated yourself to your recovery. After all that, maintaining your weight loss results is easy. Every postoperative patient who has lost a significant amount of weight is given the same instructions when it comes to maintenance: follow a healthy lifestyle. Unfortunately, saying the words is easy but knowing what they truly mean isn’t always. Immediately following your surgery, you are likely to receive a list of diet do’s and don’ts while you are recuperating. It will be recommended that you increase your protein intake (to help with wound healing) and fiber intake (to avoid constipation) while also incorporating as many vitamins and minerals into your diet as possible (especially vitamins A, C, D, and E); additionally, you will be told to decrease overly processed or sugary foods. 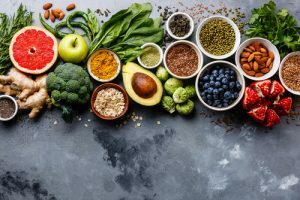 While your recovery diet is necessary when you are healing, and you need to make sure that you recover properly and quickly, following a similar diet after your recovery is a great way to maintain your results. Your diet should be filled with proteins (such as the protein found in chicken, turkey, seafood, eggs, dairy, and tofu), fiber (such as that found in fresh fruits, vegetables, and whole grains), and vitamin-packed foods (like carrots, sweet potatoes, leafy green vegetables, and beans). Many patients who have lost weight with body contouring discover that they both need and want to adjust their diets after their procedures; however, that doesn’t mean that you need to give up other not-so-good foods that you enjoy. Truthfully, just like you were taught at a young age, you just need to remember that everything should be enjoyed in moderation. If you lost weight on your own, then your weight loss most likely included an increase in exercise and activity level. Hopefully, you found activities that you enjoy. While hitting the treadmill at the gym every day is great for some people, it isn’t the right type of activity for everyone. You need to find what physical activities you enjoy participating in: maybe it’s going for a hike or a run in the park, maybe it’s playing sports like basketball or soccer, maybe it’s yoga, or perhaps you prefer to chase your kids around the jungle-gym. Whatever the activity is that you most enjoy, allow yourself to incorporate it into your daily schedule. If you are interested in taking the next step after your weight loss, then body contouring procedures may be for you. To learn more, contact Dr. Goldschmidt by calling (216) 350-3175 or use the online form to set up a consultation.